Creating professionally looking slideshows is easy with the help of slideshow software. 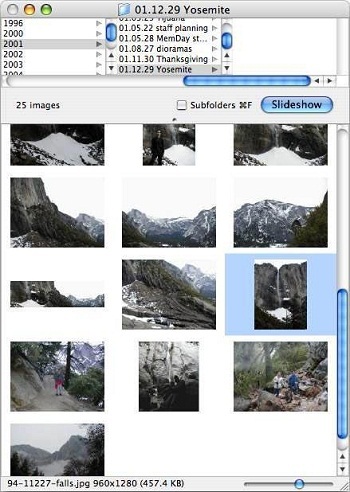 There are plenty of free slideshow makers for Mac and each one has unique features. If you want to create your own slideshow, starting with these free slideshow software will be truly helpful. Phoenix Slides is great for full-screen slideshows. The software supports EXIF data and JPEG transformations. It is easy to rotate and zoom photos with this program as it uses Epeg to load photos quickly. Pros: Simple UI, loads photos quickly, supports EXIF data and JPEG transformations. Cons: Limited features, does not support visual effects. HyperEngine AV is basically a multimedia editor. With this software, you can create impressive slideshows using photos, videos, texts and recorded sounds. 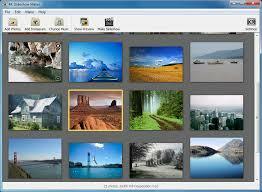 Its drag-and-drop feature is handy to use especially when sorting many photos for the slideshow being created. Pros: With twelve studio quality effects, can create DVD quality slideshows. Cons: Difficult to install, with reported bugs in accessing videos. Cocoa Slideshow is an image viewer and slideshow maker. It is open source so it’s totally free to download online. The app also supports Apple Remote, user metadata and GPS mapping. Pros: Open source, supports GPS mapping, with Apple Remote support. Cons: Few features, with reported bugs upon installation. Slideshow Magic can create professionally looking slideshows out of your photo collection. 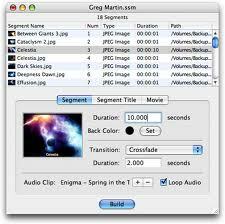 Finished slideshow is saved in a QuickTime-compatible format. The user interface is generally easy to navigate and you can have the finished output burned in a DVD. Pros: Can produce professionally looking slideshows, simple UI, compatible with QuickTime. Cons: When uploading slideshows, you will need your own FTP client, DVD burning should be done through third-party software. 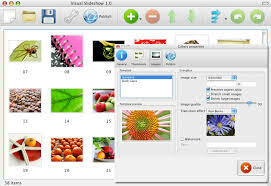 Visual Slideshow is a very simple slideshow maker for Mac. It has this handy drag-and-drop feature for organizing photos and transition effects are readily available without the need for any code. The visual effects included in the software are great and you can create slideshows within minutes. Pros: Simple UI, great transition effects, doesn’t need Flash to view the slideshow created. The 4k Slideshow Maker is very simple to use and doesn’t include extra useless features that you will not need in creating cool presentations. The software has many transition effects and music included in its database so you will have lots of options in creating your own slideshow. 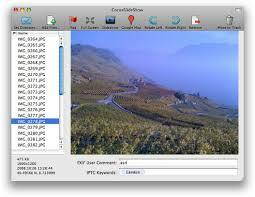 It also supports creation of HD presentations and video output can be saved in different formats. Pros: With many visual effects and music included, supports HD presentation, plenty of file formats supported. Cons: With reported bugs in saving finished slideshows. 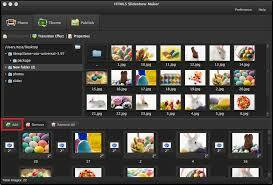 HTML5 Slideshow Maker is helpful in creating HTML5 slideshows from your photos and music files. The software provides plenty of templates and visual effects for presentations. It will also let you add or modify background colors, title, texts, hyperlinks and many more. Pros: Lots of slideshow templates available, allows changing of background color and frame rate. Cons: Finished presentation has a watermark “Powered by html5-slideshow-maker.com” included. iMovie is usually pre-installed in Macs and it can also be downloaded for free online. The software provides creative ways on how you can create memorable slideshows with photos and videos. There are several slideshow templates to choose from and it also features great audio backgrounds for the slideshows created. Pros: Simple user interface, great transition effects available. 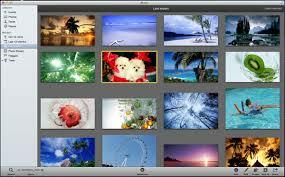 iPhoto is not only an image-editing program as it can also help create interactive slideshows from photo albums. 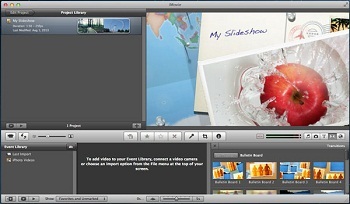 The slideshows created can be exported to QuickTime and iMovie where you can further edit everything. The software is equipped with several special visual effects and audio effects so you can make each slideshow unique. Pros: Equipped with image-editing tools, with several special audio effects. Cons: Few visual effects available. 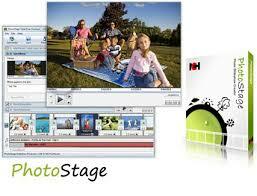 Creating high quality slideshows and presentations is easy with PhotoStage Slideshow Producer. The software supports recording of a narrative audio while going through your presentation which is great in customizing it for your needs. There are many other slideshow tools included in the software and you can even combine different types of media into one slideshow presentation. Pros: Packed with features, easy installation, intuitive UI, full HD supported. Cons: Some features are confusing to use. It is now easy to create stunning slideshow presentations from the abovementioned slideshow software. Try each one and see which offers the features you just need for your slideshows. After all, everything in the list is free to download online!